I received a mystery package recently, opened it up, and discovered a popular appetite suppressant inside. Sprinkle this magic powder on your food, the included literature instructed, and allegedly it would cooperate with your sense of smell to curb your cravings. And here it was in my hands – a whole box of the stuff. But I didn’t order it. Shortly thereafter I received a second package. This time it was a set of CDs: “Quick and Simple Japanese; Learn to Speak the Language in 10 Days.” With the box still in my hands, and as I wondered about it all, a third package arrived at my door. It was a box of those super-absorbent hand towels sold on late night infomercials. Then I knew what was going on. Someone had stolen my credit card information and was having his way with my account. I called my bank immediately, and oh yes, a cyber-thief had been very busy. Dietary supplements, Japanese CDs, airline tickets to Bangladesh, car wax, hundreds and hundreds of dollars of charges. Of course, we have a unique 21st century name for this type of crime: Identity theft. What a strange phrase that is; as if a person’s humanness can be reduced to the digits on a piece of magnetic plastic, the nine numbers individually assigned by the US government, or an email password. How ridiculous and superficial. 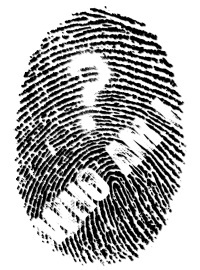 Surely there is much more to personal identity than what can be hijacked over the internet? Absolutely, but most times we are content with the shallowness of it all, because most of us have no real sense of who we genuinely are. We are made to be as Christ, but we have settled for much less. As Paul put it so succinctly in his letter to the Galatians, “I have been crucified with Christ so I no longer exist. It is Christ who lives in and through me.” The “Christian life” for Paul was a wondrous exchange of identity. He had swapped his individuality for the person Christ was forming and constructing within him. “Paul” no longer existed. Christ was now the animating force of his person, the center and ground of his being. Yet, so few of us know that Christ-shaped self, the real person that Jesus would create in each of us. Instead, we have this edifice, this outer image we portray to others and protect at almost any cost; this shell that we have constructed around us for years (or what has been imposed upon us by others). But it’s just that – a shell. It is bark on the tree, protecting what is inside. And when that bark gets peeled back, and life will surely peel it back, then most of us discover that we are pretty hollow on the inside. We lack substance. We are just names and numbers without any real identity. We haven’t let the Christ-life be fashioned within us, thus we have no self except the false, egotistical one that we have carefully manicured. The short of it is this: We are un-crucified (if such a word exists). For when the nails of Providence painfully pierce our self-centeredness, we choose to jump down from our crucifixion. When the fires of God’s grace rise to burn away the shoddy lives we have constructed from bits of straw and chaff, we leap from the altar as quickly as possible. When the weight of the cross, the cross that would crush and remake us, falls heavy on our shoulders, we crawl from beneath the load before it finishes its work. Yet, the forging of faith and the making of lasting Christ-centered identity is only accomplished by means of execution. By loss. By the death of the false self. So as long as you protect what you think is yours, so long as you struggle to avoid all necessary suffering, so long as you refuse to relinquish the identity you have constructed, you will never become who Christ would make you – the real you – the you that can never be thieved away.